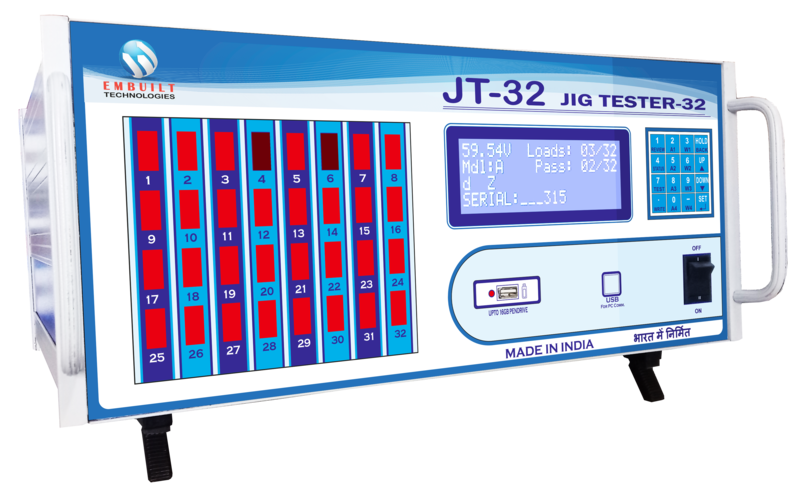 JT-32 is a modern Jig tester device. Which are test 32 AC products at one time. AC products manufacturer companies have a big problem in the testing of their products accurate and fast. Testing of products consumes huge time. JT-32 provides the facility of fast and accurate testing of products by jig testing method. It tests 32 AC products within 2 seconds and also saved all testing result in its internal memory. It measures AC Voltage, AC Current and AC Wattage. JT-32 also provides the facility of Pass/Fail Status by Red LED light. The operator can set lower and upper limits of these AC parameters (Voltage, Current & Wattage) and if any load, goes out of set limit then JT-32 indicate Fail status for that particular loads. If we connect 32 loads for testing and 10 loads go out of set limit then its shows Fail status for that 10 loads and Pass status for rest of all. and when the operator gets its datasheet from JT-32 device, it also mentioned Fail data in the report. Pass/fail Status Yes It shows the Pass / Fail status of the testing loads according to their set limits. Limit Settings Yes Operator easily set lower and upper limits for testing of products. Limit settings available for AC Current and AC Wattage. Data Logging Yes It saved testing data in its internal memory up to 32000 tests. and operator it through pen-drive. Safety Yes Optically isolation for USB and Pen-drive port. LOC Yes Log On Connect facility available in JT-32.